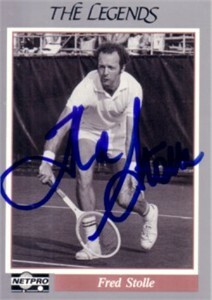 1991 Netpro Legends tennis card autographed in blue marker by former superstar Fred Stolle, who won the 1965 French Open and 1966 U.S. Open. With certificate of authenticity from AutographsForSale.com. ONLY 2 AVAILABLE FOR SALE.